Sam Glanzman’s U.S.S. Stevens: The Collected Stories, published by Dover Graphic Novels [Dover; $39.95] is a landmark gathering of one of the greatest comics series of all time. These shorts, sometimes as little as four pages, rank among the very best war comics that the comics industry has ever seen. I’d put them right up there with Harvey Kurtzman’s Frontline Combat, Archie Goodwin’s Blazing Combat and the best of the DC war titles by Robert Kanigher, Joe Kubert, Russ Heath and others. Some background: Artist and writer Glanzman, who served on the USS Stevens during World War II, created these autobiographical slices of history. Though some of the details were changed for dramatic effect and some of the episodes are Glanzman telling of events we experienced second-hand, they are among the most true to life war stories ever seen in comic books. 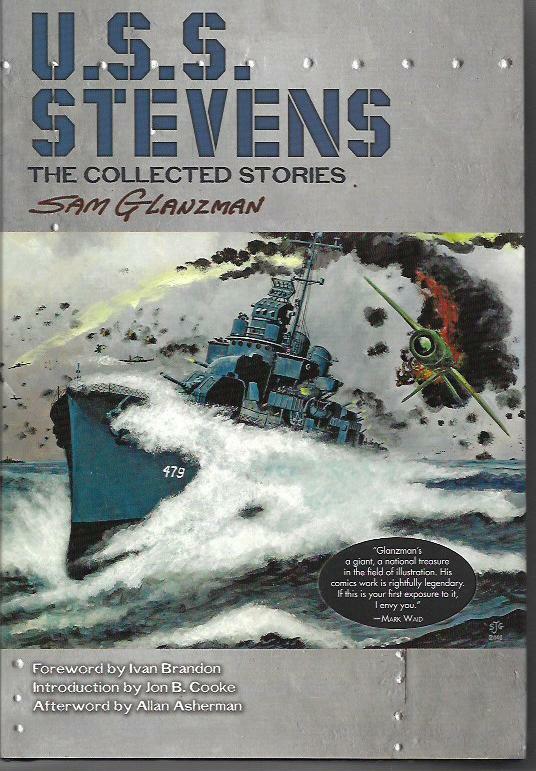 The USS Stevens stories appeared in DC war titles Our Army at War, Our Fighting Forces, G.I. Combat and Star Spangled War Stories. The legendary artist and editor Joe Kubert thought so highly of them, and of Glanzman’s genius, that he gave the artist great freedom to tell the stories Glanzman wanted to tell. Glanzman gave us tales of war’s horror and tedium. He gave us looks at the Japanese enemy of his war. He gave us stories of heroes and of fighting men damaged by their wartime experiences. In the justly-praised “Toro,” though the times demanded Glanzman be circumspect, he related the story of a gay sailor. This was perhaps a first for mainstream comic books. This Dover collection is a dream come true for Glanzman fans like me. Whenever I compiled lists of collections I’d like to see, the USS Stevens stories were high on my list. There are over 60 short stories in this hardcover volume, as well as stories from Marvel’s Savage Tales and DC’s Joe Kubert Presents. I read them at a rate of two or three a day so that I could savor and study them. This was time well spent. In addition to these groundbreaking stories, the volume includes a foreword by writer Ivan Brandon, an introduction by Jon B. Cooke, letters to Glanzman from Presidents Barack Obama and George H.W. Bush, an informative afterword by former DC Comics assistant editor Allan Asherman, Glanzman’s War Diary spreads, extensive footnotes and story annotations by Cooke and a new four-page story of the USS Stevens. It took over 400 pages to present all this great material. U.S.S. Stevens: The Collected Stories is my pick of the week. The book would make a great gift for comics fans and non-comics readers interested in the history of the Pacific War. It belongs in every public and school library in the country and should hold a place of honor in your home library. Avid “Tony’s Tips” readers know I’ve an interest in pre-code horror comic books, even when the stories and art aren’t exactly classic. But no pre-code horror comics has fascinated me in quite the same way that Superior’s Journey into Fear fascinates me. 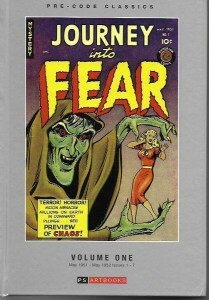 PS Artbooks out of the U.K. has collected the first seven issues of this odd title in Pre-Code Classic: Journey into Fear Volume One [$59.99]. These comic books were originally published from May 1951 to May 1952. Here’s what I can tell you about the title. Superior Publishers Limited was a Canadian publisher who published mostly American reprints, but which also published original comic books that were distributed in the United States. From maybe 1946 to 1954, Superior published just over 200 different titles and just under a thousand issues. Journey into Fear ran 21 issues from May 1951 to September 1954. We have virtually no credits for any of these issues, save that they were written and drawn by the Jerry Iger Shop. Some of the earliest stories might have art by Matt Baker, but, since he was the best of the Iger bunch, he was also the most copied. The art has an uniform house style look to it. The writing is where my fascination lies. It’s not really very good writing, but you can see where the unknown authors are striving for good writing. The stories are in a league of their own with quirky plots that often reveal non-supernatural causes for the seemingly supernatural events of the tales. My favorite story to date – I’m currently reading the second volume in the series – is “A Debt to the Devil” where the title character pushes a down-on-her-luck young woman to take a job with a handsome man whose wife is both evil and insanely jealous. The devil wants to claim the wife’s soul and eventually does so. In the process, he actually brings the young woman and her boss together romantically. He’s like a 1950s horror comic version of that creepy white-haired eHarmony spokesman. That’s just one of very strange stories in this volume. Small wonder I want them all. Congratulations to Valiant Entertainment on the publication of X-O Manowar #50 [$4.99], a milestone celebration. 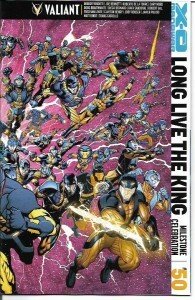 The wrap-around cover is a 50-artist jam featuring X-O figures by such legendary artists as Neal Adams, Butch Guice, Phil Jimenez, Bob Layton and 46 other creators. The extra-length “Long Live the King” by Robert Venditti with penciler Joe Bennett and several others is a most satisfying conclusion to this chapter in the life of Aric of Dacia. The issue also presents short comics stories written by Fred Van Lente, Jody Houser and Matt Kindt. It’s a heck of a celebration. Valiant has constructed an entertaining, intrigue and viable comics universe. If the DC and Marvel universe have gotten too large for you but you still love the idea of a shared universe, I think the Valiant comics titles might be a good fit for you. The writers and editors do a good job recapping enough of what has gone before to allow easy entry into their world. Most of their earlier issues are also available in trade paperbacks. I recommend starting with Faith and Bloodshot – my favorite Valiant titles – and going from there. I think you’ll enjoy the journey.